Clifford 'Crix' Coriette former national footballer fondly remembered. The sad passing of Clifford Coriette, a former national footballer of the Forties and early Fifties, who died at the ripe age of 94, was received with deep sadness. Crix, as he was well known in his football days, was an outstanding footballer who excelled on the forward line as centre forward in the days when Dominica played in the system of five forwards, three halves, which included the centre-half (who usually carried the team) two full-backs and of course the man in goal. He was a member of the Dominica team in Curacao when a number of young Dominicans migrated to that country and there, as a member of the Dominica team (see picture) made Dominica proud by winning the championship one season in the national league. 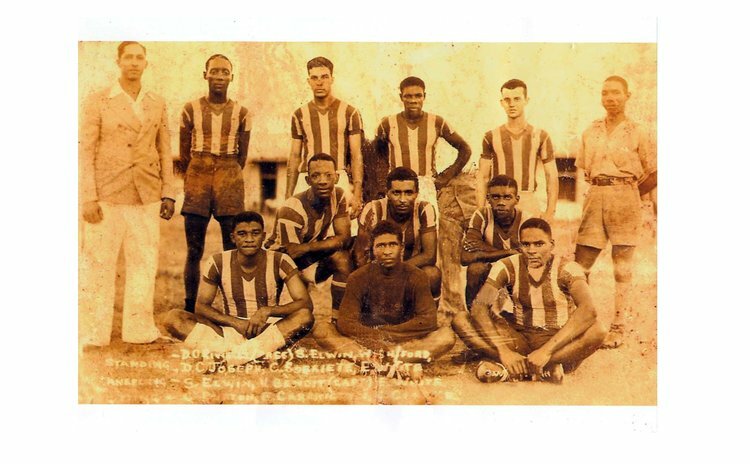 On his return to Dominica in the Fifties he continued playing football, and specifically for Shamrock in the local competition. Who could ever forget the introduction of the famous scissors kick that he performed which baffled many goal-keepers; an art copied by many young players later on. His opponents could find no answer to his trickery and skills. His knowledge of the game was well-respected; he was looked upon as an authority. I personally have a lot to remember about Crix. As I look as far back as 1950, I remember that there was a telephone call to me, on the job, by the then Dominica football captain, the late Carlton Felix, informing me of my selection on the Dominica team to play against MMS Glasgow, one of two battleships at anchor in Woodridge Bay. As the man previously selected, Crix Coriette was unable to play due to injury. I welcomed this opportunity and turned out for the match which Dominica won. The next day, February 27th, the same team was selected to play against MMS Snipe, the other ship. As we say forward to Crix, it is sad to say that he is gone but his memories will forever remain. I extend deepest condolences to his entire family. May he rest in peace.